January 25, 2019, 7:00 p.m. 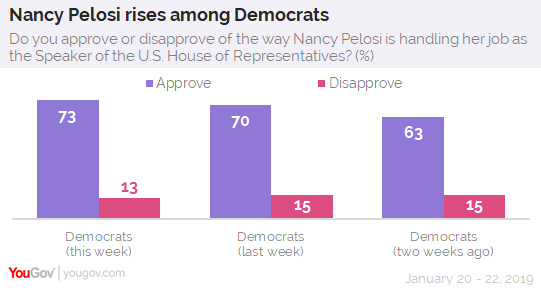 Since the start of the 116th Congress, House Speaker Nancy Pelosi has gained increased support from Democrats, both within the House of Representatives and among Democrats nationwide. In the latest Economist/YouGov Poll, she enjoys her highest ratings of the last two years, with nearly three in four Democrats approving of how she is handling her job. Although Pelosi gets strong support from Democrats, Republicans take the opposite view, and are about as negative toward her performance as Democrats are positive. This week’s poll finds just 13% of Republicans approve of Pelosi, while 75% disapprove. Republican opinion of her has changed little over time. Pelosi still has some detractors among those in her party. During the 2018 campaign, there were calls and promises to not vote for her as Speaker if the Democrats took control of the House. In December, nearly one in four Democrats wanted someone else. Just half of those who supported Bernie Sanders in the 2016 Democratic primaries supported Pelosi for Speaker. 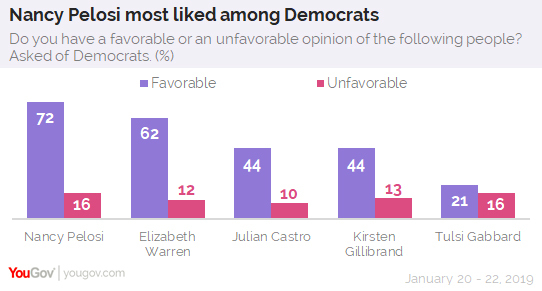 Now, more than two-thirds of Sanders voters have a favorable opinion of Pelosi, and 75% approve of the way she is handling her job. Pelosi’s popularity among Democrats is higher than that of her Senate colleague, Minority Leader Chuck Schumer. 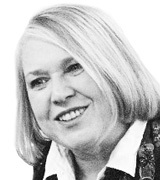 Democrats like her better than Republicans like their party leaders, Senate Majority Leader Mitch McConnell and House Minority Leader Kevin McCarthy. 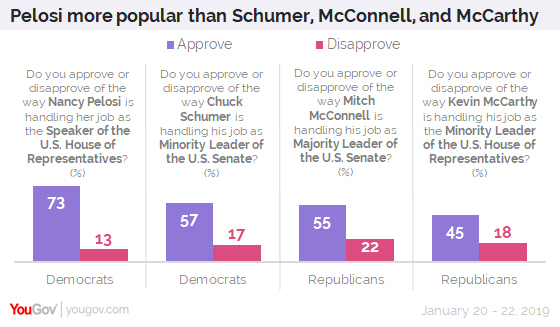 McConnell’s popularity with Republicans rose during the confirmation hearings for the newest Supreme Court Justice, Brett Kavanaugh. Two others who have declared themselves, former Maryland Representative John Delaney and Virginian Richard Ojeda, are even less well-known.